* reboot(8) command has behaviour different from the documented one, in particular when passing optional REBOOTCOMMAND argument, whilst not in runlevel 0 or 6 and without passing --force, shutdown(8) was not invoked with the appropriate arguments. Actual behaviour was dropping to runlevel 1, instead of the expected reboot. * machine should complete reboot. Actually just exoerienced this same symptom on a machine running 12.04.2, on 'shutdown now' went into maintenance console. Is this normal ? Also happening to me - same symptoms. Updated server to 13.04. MOTD still says "New release '13.04' available"
"shutdown now" is supposed to switch to single-user mode (see bug 1065851). 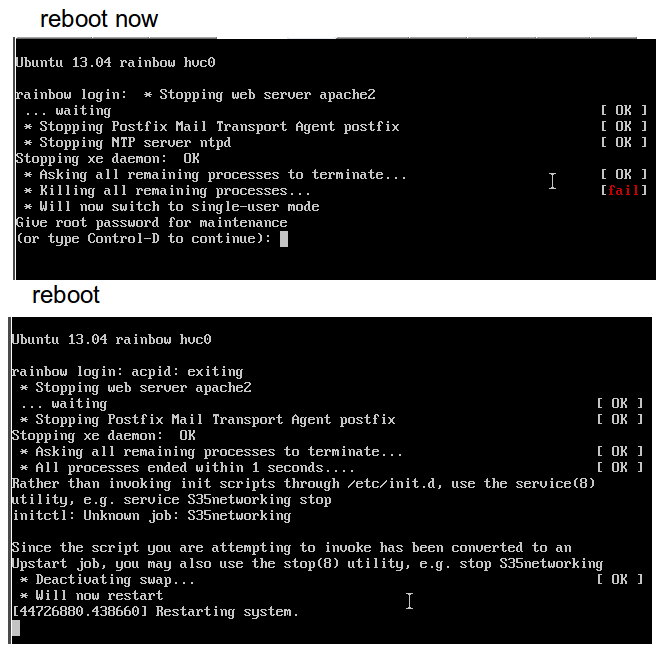 "reboot now" is invalid - the shutdown command takes a time parameter (such as "now"), but the reboot command does not (see the man page). By specifying "reboot now" you are asking the system to reboot by running the "now" command, which is erroneous. I'll also be happy go back on my previous rant which may otherwise have come across as rude, if it can be explained why 'shutdown now' does not halt the system by default. It would seem to me that 'power-off' is a far more intuitive default action to be associated with 'shutdown TIME' than merely reverting to single-user mode? Why doesn't single-user mode require an argument the way halt would anyway? Because that is how shutdown has worked for 20+ years. The system is going down to maintenance mode NOW! It was an error in that release of upstart that has been corrected. Classic sysvinit shutdown has behaved this way because that is how unix systems have always done it. 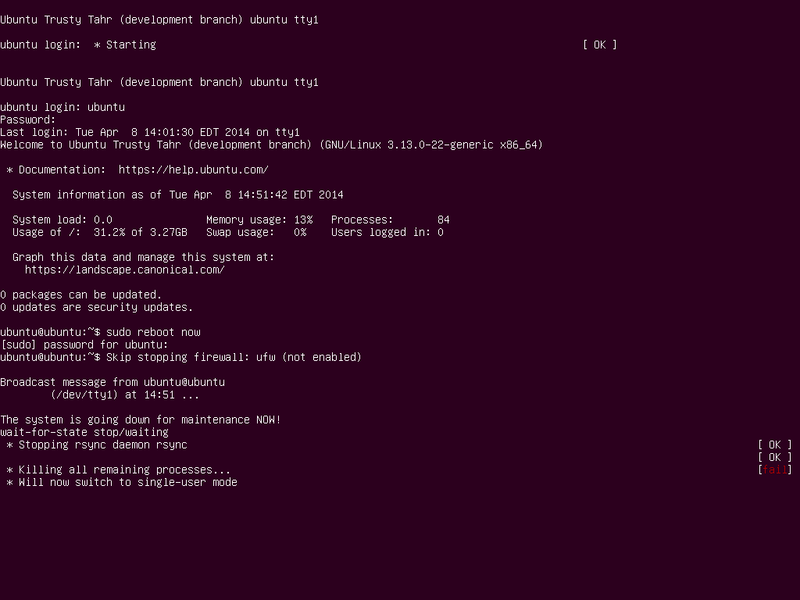 I just performed a fresh install of Ubuntu Server 13.04 i386. The initial reboot was fine, but using "sudo reboot -h now" caused this to happen. From single-user mode root I was able to run "shutdown -h now" and it booted back up fine. So, the preferred method is just "sudo reboot" from here on out? I'm fine with it, just making sure. same here - reboot now worked for me for years... now doesnt work after upgrade to 13.04 desktop. There is no need to keep commenting on this: once again, it is not a bug, the reboot command does not take a time argument. Not taking an argument is one thing, failing to reboot with an error message would then be fine. A completely different thing is showing unexpected behavior, by shutting everything down and leaving an open root console. invokes the shutdown(8) tool with the appropriate arguments without passing REBOOTCOMMAND argument. It says that it will simply invoke shutdown *without passing REBOOTCOMMAND*. If the command actually did that, then this bug wouldn't exist. So, yes, it IS a bug. You are right, the man page does say it is only used with --force. Interestingly, it seems the reboot command from the old sysvinit package completely ignored this argument, not using it even with --force, despite the man page saying so. Upstart's reboot command did the same thing in precise. It was patched to try and fix this and actually do as the man page says, but it looks like the patch was wrong, and causes a shutdown without the -r switch to reboot when REBOOTCOMMAND is given without --force. What is more weird, is that the kernel doesn't actually use this REBOOTCOMMAND anyhow; it seems to have absolutely no purpose. * Revert spurious +x -> -x change on daily upstart cron file. Please fix the most annoying bugs. It interferes with work, use and distribution advice to friends. Accepted upstart into trusty-proposed. The package will build now and be available at http://launchpad.net/ubuntu/+source/upstart/1.12.1-0ubuntu4.1 in a few hours, and then in the -proposed repository. Accepted upstart into trusty-proposed. The package will build now and be available at http://launchpad.net/ubuntu/+source/upstart/1.12.1-0ubuntu4.2 in a few hours, and then in the -proposed repository. `$ sudo reboot please` now correctly reboots machine, instead of erroneously dropping to runlevel 1. If 'reboot now' is working also, then we can surely consider this resolved. * debian/manpages/upstart-events.7: Correction for 'rotate-logs'. * debian/upstart.cron.daily: Specify full path to initctl. * init/man/init.8: Add missing information on '--chroot-sessions'. * debian/upstart.apport: Sort system and session jobs. The verification of the Stable Release Update for upstart has completed successfully and the package has now been released to -updates. Subsequently, the Ubuntu Stable Release Updates Team is being unsubscribed and will not receive messages about this bug report. In the event that you encounter a regression using the package from -updates please report a new bug using ubuntu-bug and tag the bug report regression-update so we can easily find any regressions.